ICT4D Solution Incubator Cambodia is a SPIDER funded initiative working to assist CSOs and grassroot organisations to effectively and strategically use ICTs in their work. 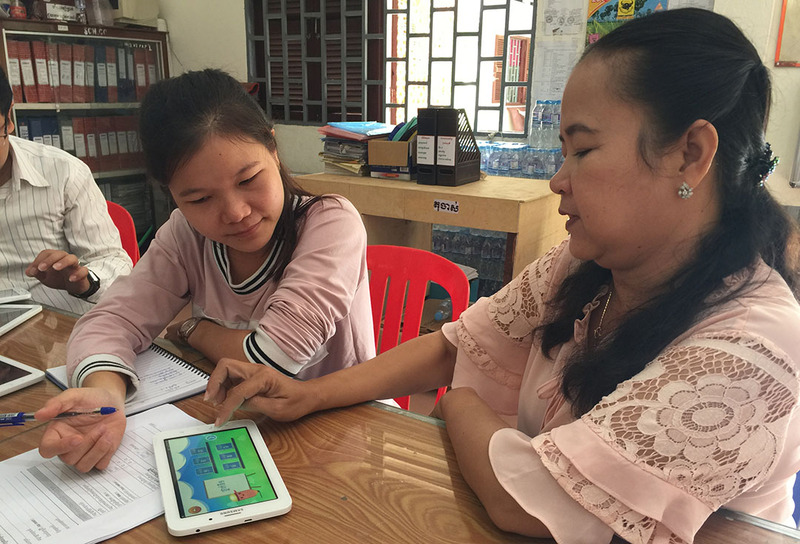 The focus is on 10 organisations working with change initiatives in Cambodia and the activities include understanding the problem or gap the organization wants to solve or fill, and identifying context specific solutions that rely on the effective and strategic use of ICTs. In this update we highlight one of the organisations InSTEDD is working with to gain an understanding of the methods employed and what the research feedback sessions contribute to the training process. KAPE is one of Cambodia’s largest Non-Government Organisations working in the education sector. Established in 1999, KAPE has introduced the use of technology in early grade reading to increase efficiencies in school development (For more information please visit: www.kapekh.org). As the pictures illustrate, much of the activities are taking place on tablets, which requires digitialising of reading literature. Most IT platforms have accommodated the latin script, but there are a number of language scripts that have been excluded. Khmer was one of them along with a majority of the languages belonging to the Brahmi family of language scripts. That is, until open source solutions that allow for the programming of various scripts into user interfaces were developed. 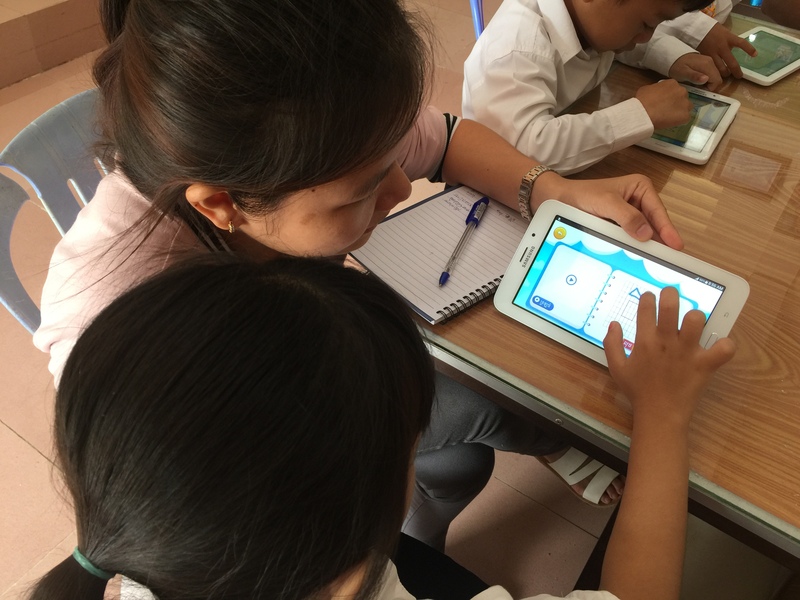 InSTEDD is working with KAPE in developing reading content in Khmer for grades 1 through 3. The research has found from field tests that touch screen experiences are limited for many users and time should be devoted to familiarising users with the use aspects of the interface before delving into evaluating the content. Coming from traditional teaching methods also means that instructions coming through the digital platform must provide extensive explanations for the students to understand what is required of them. Reading as an activity traditionally requires that a teacher sits within hearing distance to follow and assist a student learning to read. As the tablets are supposed to encourage individual learning, the absence of the teacher should be compensated with celebratory characters that will inform students of their progress. The research also found that some features needed enhancing, for example resizing application icons to improve usability. These recommendations were picked up in the results follow up activities and have been incorporated by InSTEDD in the follow up sessions. The research reports are being fed directly into the implementation activities as the 10 organisations contribute with their feedback on what needs improvement. Some organisations identified logistical issues which InSTEDD has addressed in the follow-up sessions. For instance, the timeframe for the iCamp sessions has been extended from one day to one and a half days. A broader introduction has been incorporated, as some of the organisations taking part in the capacity building are hearing about Human Computer design processes for the first time. More time has been devoted to explaining these processes carefully.